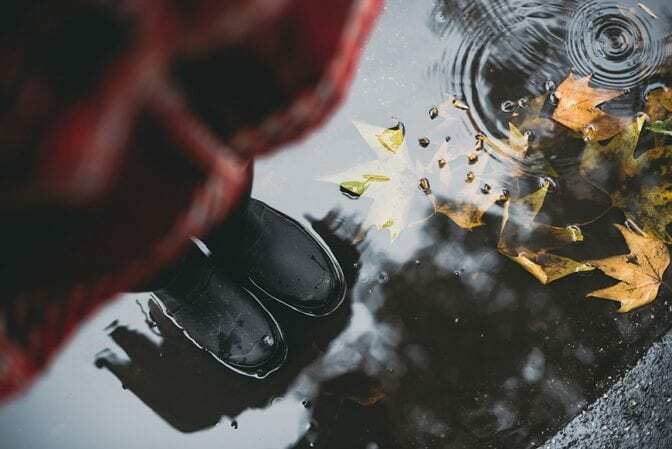 Waterproof travel shoes can be important if you are traveling in a location with rainy cold weather, or if you're hiking in a terrain with lakes and streams. There are so many kinds of waterproof shoes on the market. I really wanted to feature the full gamut of choices, from straight up hiking shoes, to rain boots, to thongs and sandals. Many of them pair well with your little black travel dress! Read on to find out my top 10 picks for the best waterproof travel shoes for women! I featured quite a few types of waterproof shoes on the list, check below to see which type is which! Cost is almost always a factor in the shopping process. I'll let you know which are bargains and which are investments. Look for this icon to find out what material the shoe is made out of. Check for this icon to see the shaft to arch measurements in inches. Merrell's Waterproof Hiking Boot is super functional and stylish too! I absolutely love the 'Boulder Blush' color which pairs a light miliatary green color with super cute pink highlights. It features a Vibram sole, breathable mesh panels, and a sturdy lugged sole. The Vibram lugs featured on the sole help to make the shoes ultra stable and since there are no lugs placed under your arch, it results in even more comfort on your journeys. This is from Merrell's M Select Dry products line and moisture is repelled off the surface of the fabric. Traction on these shoes is great even in extremely wet or dry conditions. These shoes are great because they need no break-in period, they are ready to go out of the box. You can even walk on ice quite easily! The Moab hiking boots are lightweight and feature great arch supports. One issue is that the sizing can be a little off, they run small. If you are planning on wearing thick socks, definitely purchase a least a half or full size larger than your regular shoe size. Keen's Targhee II Hiking Shoe features a rubber sole, breathable mesh tongue, a KEEN.DRY waterproof membrane, removable insole, cushioned collar and aggressive lugs. The membrane is enclosed in a waterproof shield and the footbed melds to the shape of your foot for the ultimate comfort. Chooka's Skimmer Ballet Flat features a synthetic sole and a slight heel of 0.25". It runs big so make sure to purchase 1/2 size down. It's the perfect little slip on shoe and keeps your toes dry to boot! The rubber sole is super grippy and great in mud and rain but not meant to be for trudging on snow and ice. It also features a synthetic rubber upper and insert with a cloth lining. These looks great with shorts or jeans and they are just so soft and comfy. The rubber is quite flexible and it features a soft insole. They'll stand up to long days of walking comfortably as they adjust to the shape of your foot well. Also, they don't slip off while walking. It's my favorite little waterproof flat! Next up we have Ahnu's Salena Thong which features an a waterproof membrane, a hydrophobic mesh upper and waterproof leather. These sandals are perfect for the beach and you don't have to worry about getting them wet. It features multi directional lugs for traction and a Vibram mega grip outsole for durability. The midsole is constructed from polyurethane and is super comfortable and durable. This basic thong matches almost anything in my wardrobe! There is some arch support and I appreciate the toe grip. These are the perfect little vacation shoe and you won't have to pack a bunch of other pairs as it matches everything! Love these cute little rain boots from Henry Ferrera, so edgy and stylish! They also come in ten different color combinations. The shaft measures 6 inches from the arch and it has a little .25 inch platform and a 2 inch heel. The boot is constructed from stretchy rubber so you can easily slip i on and off. These boots are sleek and comfy and not clunky at all, they have a nice sleek shape. They are also great walking shoes, just make sure to get a half size up if you plan to be wearing thick socks. These are probably the most stylish little waterproof rain boots on the market! Another super cute and stylish pair of waterproof shoes, this time featuring the brand Satuki. This shoe is constructed from pleather with a 1.4 inch heel and .8 inch platform. I love the furry wool lining and sole of this shoe is made of rubber. This shoe is comfortable for long periods of walking and is waterproof, lightweight and anti-skid. I love the stud detailing on the top of the shoe. I really like many of the shoes from Satuki's line! The shoes are all super stylish and super well priced. They feature the cutest platform sneakers and boots! Blondo's Fantasia Ankle Boot is made of leather and features shearling lining. It's lined with natural wool and has sealed seams to prevent any water from getting in. The stacked heel is 2 inches high and the shaft is located 7 inches from the arch. This boot is designed in the classical equestrian style and is perfect for the active women. The soles are super flexible, have a good grip and are durable. The boots are fully lined except at the bottom and will definitely keep your feet nice and warm. You don't need to wear these boots in, they are ready to go! These are great walking shoes that will withstand long trips. They are pretty true to size, even with relatively thick socks. These are a great premium investment. Chooka's rainboot is made of 100% leather and it comes with its own nylon travel bag! The shaft is located 13 inches from the arch and the eva insole is removable. The fabric lining inside is moisture absorbing. The boot is specifically designed to run big to allow for thick socks. The brand recommends to order an entire size down. I love that these boot are foldable, featuring foldable rubber technology and do not take up too much space. The soles feature tread to precent slipping and they pop right back into regular shape even after spending time folded in your luggage. These boots are quite light and breathable and just feel like quality boots. If you are looking for a rainboot without a heel, these are the perfect ones! The Best Silicone Bra to Wear Under Your Swimsuit When You Travel!